Have your deck perfectly cleaned at a discounted rate with our deck cleaning in Swansea team. We have many years of experience in delivering top results. Our services have won us many return customers… have a look at our testimonials page to see the feedback they’ve left us with after using our services! Our wood cleaning in Swansea team have undergone extensive training in cleaning decks to perfection. We will fully remove algae, moss and stains from your decking, no matter when you last had it cleaned. 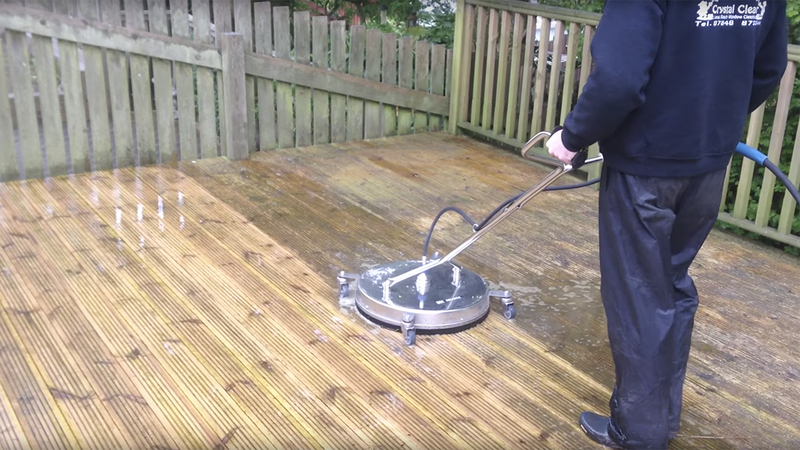 We use a range of tools, cleaning and polishing products to make your decking appear spotless, and look rejuvenated. When choosing our deck cleaning in Swansea team to scrub, clean and polish your deck, you will receive great value for money. Our wood cleaning services offer a number of benefits you can take advantage of. We offer our services seven days a week and in the evening for the same price. Our company has an ongoing policy to deliver environmentally safe services, and uses eco-friendly cleaning products. We will pay extra attention to stubborn stains, algae, moss and sign of pollution, to guarantee their full removal. Our team will have the weeds in cracks and crevices efficiently removed with the help of non-toxic products. When booking our maintenance services on a regular basis, you will have your wooden decks looking great at all times. Deck Cleaners Swansea. Our deck cleaning specialists have improved their skills over the years.We follow three simple steps that enable us to deliver top results - Cleaning – we will use advanced jet-washing techniques to remove stains and signs of pollution - Sanding – our team will carefully remove old sealant and will repair any damaged surface, restoring your deck’s beauty - Sealing/ Oiling – we will use of top-of-the-range sealant and oils to protect your deck from stains, UV light, algae and moss. Along with better looking and protected wooden decking, you will be able to enjoy lower rates when booking a few of our wood floor polishing services together. For example, book garden maintenance and garden furniture cleaning at the same time, and enjoy a significant discount! Call 07846 873344. Our friendly staff will offer you free quotes and help you book decking and wood cleaning in Swansea 24/7. Receive immediate answers to your questions through our online chat support feature, as well as over the phone. Another quick and easy way to enjoy our decking and wood cleaning services, is by booking them through our online booking form.